“It is not the beauty of a building you should look at; it is the construction of the foundation that will stand the test of time,” David Allan Coe. The above quote explains the importance of ‘foundation’ in the construction of a building. For if the foundation is strong enough, further layers (read floors) can be added to the building. The analogy holds true for an online store development as well wherein the ‘foundation’ is the ‘platform’ a website is built upon. If the platform is robust, flexible and secure to begin with, the website can stand the test of time in terms of scalability and load handling. Remember! You build an eCommerce website to establish your brand and reach the target audience with your products and services in the digital space. So, what can be a humble effort to begin with on a smaller scale, can, with the passage of time, transform into something big. For example, if your eCommerce site is small at present with only a few products and customer visits to show, it can grow big in the days to come. So, the eCommerce platform should be scalable enough to allow you add more products and handle more number of customers. Similarly, if your eCommerce site represents a marketplace with only a few vendors to begin with, the platform should be flexible enough to let you add more vendors, product range, payment gateways and customers when the need arises. Moreover, the platform should be flexible and scalable enough to accommodate new features, functionalities and technologies. This is necessitated due to increased customization and the advent of technologies such as mobility, AI & machine learning, analytics, virtual reality, and digital wallets. Load handling is another aspect that an eCommerce website needs to take into account while choosing a specific platform. The robustness of which gets tested when the number of users handled by it is scaled up substantially. Furthermore, the eCommerce platform should be able to handle multiple tenants, shipping platforms, payment gateways, and currency conversions with ease. 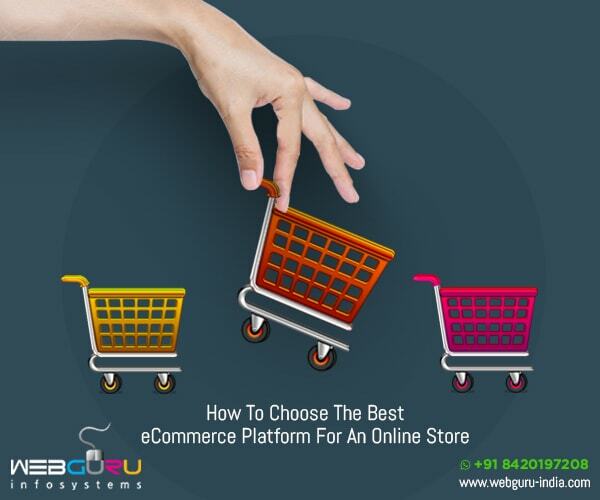 In order to achieve the above mentioned requisites, the foremost criterion is to develop your online store by selecting the best eCommerce platform notably by an experienced eCommerce development company. A platform that is robust, flexible, scalable, SEO friendly, secure, cost effective and yes, meets your business objectives. The following is a list of the best eCommerce platforms that can meet the above mentioned parameters. Magento:This open source eCommerce platform is known for its high scalability, flexibility, security, functionality and stability. It features among the top 3 eCommerce platforms on various metrics and is used by a number of notable global businesses such as Coca Cola, Ford, Lenovo, Land Rover, Nike, Samsung, Omega watches, and Huawei among others (Source: http://blog.mageworx.com/2012/11/top-10-world-brands-on-magento/). If you want to take your products and services online by way of a robust eCommerce store, then Magento can be the chosen platform. You can develop the online store either in-house or by availing professional Magento development services. Shopify: This licensed software from the Canadian based eCommerce company of the same name is best known for providing a robust shopping experience from social media and mobile platforms. The companies that use Shopify to build their eCommerce site are Megpies, The Protein Bakery, Tattly, and WWF Canada among others (Source: https://www.shopify.in/examples/merchandise-templates.) Use Shopify’s flexible architecture and a plethora of built-in features to develop a trendy eCommerce store by engaging Shopify development services or by hiring experienced Shopify developers. BigCommerce: Available on a subscription model, BigCommerce comes with a slew of features such as coupons, newsletters, analytics, and shipping. It provides a great interface with Facebook, eBay, and Google Shopping and contains around 80 professional themes (paid). In fact, there are more than 40,000 companies belonging to the small, medium and large enterprises including names such as SkullCandy, Toyota, Pandora, Sharp, PayPal, Ford UK, Motorola and Fujitsu that have used BigCommerce to build their online presence (Source: https://www.bigcommerce.com/showcase/.) If you want to join this list, then choose an experienced BigCommerce development company to build a stable, secure and functional eCommerce store. WooCommerce: Ideal for small to medium scale retailers, WooCommerce is an open source eCommerce plugin from WordPress. The staggering number of online retail stores (around 2 million) built on this platform makes it arguably the most popular. Its support for multi vendor eCommerce stores is facilitated by the presence of secure payment gateways, free or paid plugins, a plethora of themes (paid or free), and a shopping cart among others. If you want to establish an online market presence for your brand, products and services, then avail professional WooCommerce development services. Opencart: Based on PHP and using MySQL as the database with many HTML components, Opencart is an open source eCommerce platform that is SEO and mobile friendly. It is highly regarded for its robust security protocols and provides multi vendor chain stores. Some of the websites that have been built by using the Opencart platform are Ruby’s, BALR, The Cider Link, and Hampden Clothing among others (Source: https://isenselabs.com/posts/inspiring-opencart-ecommerce-sites.) To build a robust, highly secured, multi vendor and feature rich eCommerce store at cost effective rates, then use experienced Opencart development services. While going online has become imperative for the retail stores to expand their sales funnel, the need for a robust eCommerce platform is essential to address the issues of scalability and load handling. This is important to achieve a better UX and driving conversions later. If you are one of the enterprises that looks for stable, customized, user friendly, and secure online store development services at reasonable rates, then leverage the services of an experienced eCommerce development company. Good Article more help for us new Website design thanks. Your Article is very helpful and I get new ideas from Your Article. Thanks for Your Sharing…. Website is sooo good. Thanks for giving full information about Ecommerce Web Design and Development.